On July 25, ASEAN finally succeeded in adopting a joint communique after its foreign ministers’ meeting in Laos that addresses the South China Sea issue following a landmark ruling earlier this month (See: “ASEAN Can’t Be Silent on South China Sea Ruling“). A closer look at the language in the statement, however, reveals that it failed to even meet the minimum threshold of what could reasonably be expected of it on this question. After a July 12 verdict by an arbitral tribunal on the Philippines’ South China Sea case against China, several close ASEAN observers (myself included) had been calling for the regional grouping to adopt a separate statement on the ruling or at the very least issue a standard joint communique that referenced the principles undergirding the ruling. Instead, what happened at the 49th ASEAN Foreign Ministers’ Meeting (AMM) in the Lao capital of Vientiane is that the regional grouping first struggled to even issue a joint communique at all and then finally did adopt one that did not even meet the minimum threshold of what could reasonably be expected. Two Southeast Asian diplomats told me Sunday that the delay in issuing a joint statement was largely due to intransigence from Cambodia, which did not even want previously agreed language on the South China Sea to be included. Cambodia’s stubbornness was expected going into the ASEAN meeting this week, given both the country’s past role in the regional grouping’s failure to adopt statements (in Phnom Penh in July 2012 and more recently in Yuxi last month) as well as the country’s prime minister Hun Sen’s insistence earlier this month that Phnom Penh would not support an ASEAN statement on the ruling (See: “What Really Happened at the ASEAN-China Special Kunming Meeting“). As a result, ASEAN countries were locked in talks that dragged on into an emergency session before a statement was issued. Asked whether it was fair to characterize Cambodia as being a spoiler on the South China Sea issue at the meeting, one of the diplomats said sternly: “It’s more than spoiling. It’s hostage-taking”. Given this, ASEAN deserves credit for eventually adopting a statement, thereby avoiding an embarrassing repeat of what happened in Phnom Penh and Yuxi. The joint communique, a 31-page document, contains a separate section on regional and international issues, with one of them being the South China Sea which is addressed in eight paragraphs. As with previous statements, this one contains references to long-held principles such as preserving freedom of navigation and overflight and the peaceful resolution of disputes, as well as the usual call for an “early adoption” of a binding code of conduct (CoC) on the South China Sea. Indeed, having read a draft copy of the statement that was eventually not adopted at Yuxi before I reported on that incident for The Diplomat, the language is largely similar. As with that statement, there are not only references to principles and usual calls but also specific confidence-building measures that have been discussed, including increasing the frequency of the ASEAN-China senior officials meetings and other joint working group meetings, establishing a hotline between foreign ministries to manage maritime emergencies in the South China Sea, and adopting a joint statement on the observance of the Code for Unplanned Encounters at Sea (CUES in the South China Sea. There are a few notable exceptions, however. One interesting point to emphasize is the inclusion in the first paragraph of the concern “expressed by some Ministers” on land reclamations and escalation of activities in the area, which are deemed to have “eroded trust and confidence, increased tensions and may undermine peace, security and stability in the region.” Though same general paragraph was included in the Yuxi draft statement, it contained neither the “some Ministers” formulation nor the reference to reclamation and escalation. ASEAN countries appear to have found a way to mention these more specific developments as more forward-leaning countries may have wanted (including claimants like the Philippines and Vietnam) but also give laggards such as Cambodia room to opt out with the “some Ministers” formulation. But as with most ASEAN statements, what is missing is as or often more important than what is included. Indeed, parsing the language, it quickly becomes clear given what is left out, the statement can be said to have not even met the minimum threshold of what could be expected of the regional grouping on this question. Before taking ASEAN to task on what was missing, it is also important to evaluate the regional grouping in perspective. For example, it must be stressed that although several media outlets have already begun noting that the statement did not mention China or the ruling, this is a somewhat unreasonable standard. It is not traditional practice for ASEAN to mention China by name in the South China Sea language of a general joint communique (as opposed to a statement to be issued at a meeting like in Yuxi, which did mention Beijing directly). And noting specific events like the ruling would be more likely in a separate statement as opposed to the usual joint communique. 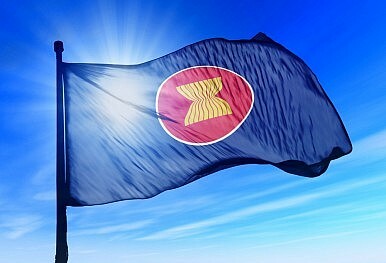 Where the organization does deserve scrutiny regarding the statement is the fact that language on ASEAN’s commitment to principles in the South China Sea section was watered down and there was no mention of respect for legal and diplomatic processes – seen as a way to generally reference the ruling without directly doing so. While the Yuxi non-statement referenced “ASEAN’s commitment” to certain principles, the AMM statement ends up only “reaffirming the need” for them, which reads like a slightly less firm formulation. More consequentially, while both the US-ASEAN Sunnylands Summit statement and the Yuxi non-statement contained the phrase “full respect for legal and diplomatic processes” within a list of principles, this phrasing was removed in its entirety from the South China Sea section of the AMM statement (See: “A US-ASEAN South China Sea Failure at Sunnylands?“). Instead, it was shifted to the introductory part of the document in order to accommodate Cambodia’s South China Sea-specific concerns. On the one hand, that’s good diplomatic finessing and certainly better than not mentioning it at all. And it comes as no surprise considering Hun Sen’s fierce opposition to any statement referencing the ruling in relation to the South China Sea however indirectly. Nonetheless, the result is that ASEAN could not even stick to what it had previously agreed but had to water down the language even further to reach consensus. In sum, though ASEAN does deserve credit for adopting a joint communique when it initially appeared that it might not do so at all, it is clear that it failed to meet even the minimum threshold of what could be reasonably expected of it on this question at the AMM meeting. Even if it does not issue a separate statement, the grouping should adopt a strong communique.